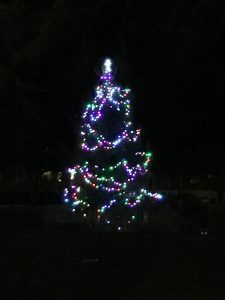 Heavy rain and strong winds failed to dampen the spirits of residents turning out to see the village Christmas tree lights being switched on in Aylesham last Saturday. Stalls and display stands which had been scheduled to set up on Market Place were hastily rearranged to St Peter’s Church, just up the road. The hall was quickly filled by eager visitors who were able to enjoy music by the Snowdown & District Colliery Band and Minster Handbells. Turning on the tree’s lights went ahead as planned, with people walking to Market Place to join in a countdown as Marilyn Burrows, from St Peter’s Church, ceremonially flicked the switch to turn them on. 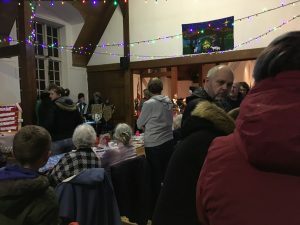 Kay Sutcliffe, a member of the Aylesham4Aylesham group of volunteers which organised the event, said: “It was such a shame about the rain and wind but in true village spirit, we still made the best of it by transferring to the church. “Everybody had a good time and there were plenty of people loudly joining in the countdown as the lights came on. 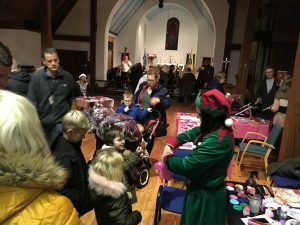 We can definitely say this was a great success for Aylesham.